Spot silver continues to trade sideways tending to follow equity markets rather than its more traditional correlation with the spot gold price which continues towards a potential high on the daily gold chart. From a technical perspective yesterday’s price action was contained in a narrow trading range ending with the silver trading session ending as a narrow spread candle but one with a deep, lower wick. 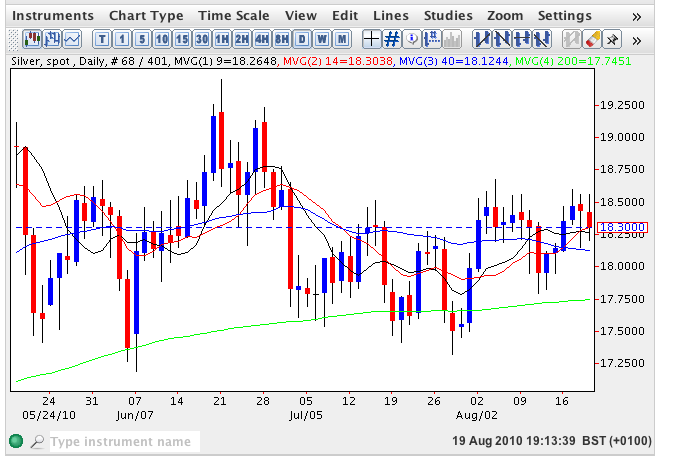 The low of the day found solid support from the 40 day moving average which suggests that bullish sentiment retains the upper hand at present although this is far from certain with the industrial metal range bound at present between $18.67 to the upside and $17.32 to the downside. With a series of higher lows to the downside during late July and early August, the breakout for spot silver, when it does finally arrive, will almost certainly be to the upside and should this be accompanied by sufficient momentum then we should see a run towards $19.13 per ounce followed by an attack on $19.45 per ounce, followed by the psychological $20 per ounce in due course.